Since 1988, LodgeCraft has been making our own line of rustic and mission style desks and Lodge Furniture, delivering them across the U.S. and Canada. In addition, we offer rustic style desks and mountain modern furnishings from a few select manufacturers that we feel proud to represent. Choose from a variety of sizes, styles, and configurations from a small rustic writing table to an impressive executive desk. You can choose from log, barnwood, reclaimed wood, alder, or hickory. Afterward, you can select your favorite finish option. Crafted in our LodgeCraft workshop in Montana, our mission style desks as well as our rustic pine and alder desks are made of the highest quality materials to ensure long-lasting durability. 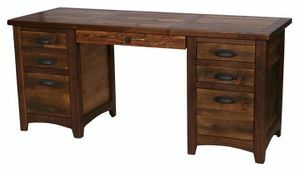 Whether you are looking for the perfect rustic style desk to complete your home or commercial office, we have what you are looking for. In a variety of finishes and styles, you are sure to find the perfect desk that will make working an enjoyable task.